This Thursday, Co-chair, Sen. Moore of Bridgeport, and I convened a meeting of the 2Gen learning community to, among other things, recognize and celebrate the six pilot sites that have been awarded 2Gen funding. These six sites, partnering with a total of over 100 agencies, including local governments and Community Based Organization will now begin to implement the 2Gen strategies that have been discovered and discussed over the last 9 months to move our low income families onto a path of self-sufficiency. The meeting's guest speaker was Dr. Alice Forrester, CEO of Clifford Beer Clinic in New Haven, who discussed working with families in trauma. Forrester explained that trauma is pervasive and how it can cross generations, effecting an entire family. I would also like to recognize the Commission on Children and the Interagency Workgroup for their efforts in evaluating the pilot sites’ proposals and for their recommendations. Governor Dannel P. Malloy and Commissioner of Education Dianna R. Wentzell announced on Monday that graduation rates in the state reached a record high in 2015 – hitting 87.2 percent, significantly higher than the national average of 82.3 percent. The Educational Reform Districts, a subset of the Alliance Districts and among the 10 lowest performing in the state, showed an 8-point gain since 2011. East Hartford School District- An educational reform district, East Hartford saw its graduation rate reach 88 percent, up 8.4 points from its rate in 2011. East Hartford High School specifically saw its graduation rate reach 94.6 percent, up 14.5 points from 2011. Manchester Public Schools- Graduation rate reached 80.8 percent, 8.6 points higher than its rate of 71.2 percent in 2011. South Windsor Public Schools- Graduation rate increased by 2.4 points, from 90.8 percent in 2011 to 92.4 percent in 2015. Four-year cohort graduation rates by state, district and school are available on the Connecticut State Department of Education’s new data portal, EdSight. I invite all residents to take look at the graduation data from their districts. 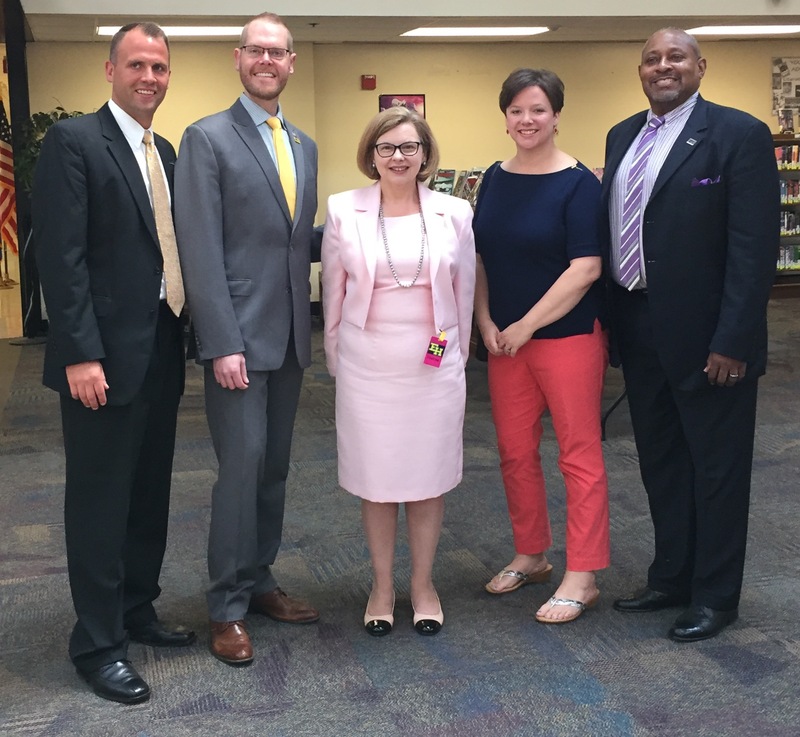 (From right to left) Superintendent Nate Quesnel, me, State Department of Education Commissioner Dianna Wentzell, East Hartford Board of Education member Valerie Scheer, East Hartford Board of Education Chairman Bryan Hall. On Tuesday, May 24, I attended the Commission on Human Rights and Opportunities' Kids' Speak, a day for students and educators from Connecticut to come together and discuss topics related to civil and human rights. Over 400 students, educators and volunteers participated in this event which was aimed to raise students’ consciousness regarding diversity, school climate and culture, anti-bullying, equal protection, neighborhood isolation and housing and busing. The CHRO also offers a Kids Court Essay Contest. For information on how to enter, click here. Submissions must be sent by July 1. East Hartford Board of Education member Val Scheer and the CT and National teacher of the year, Jahana Hayes from Waterbury public school district. On Thursday, I attended O’Connell International Baccalaureate (IB) World School’s 2016 Grade 5 Exhibition. As the culminating Primary Years Program (PYP) experience, it is required that the Exhibition reflects all the major features of the IB program. Through this program, students engage in collaborative, in depth inquiry about a community relevant and globally significant issue. Topics included animal abuse, autism, breaking stereotypes, racial stereotyping and bullying. I am very proud of all these students for their hard work on their projects! I also want to thank the principal and staff for their support of the IB program! East Hartford has the PYP and the Diploma Program at the Connecticut IB Academy, which is ranked as the #1 ranked public school in the state! This year the East Hartford Board of Education began certification for the Middle Years Program at Sunset Ridge, completing the Kindergarten through Grade 12 IB pipeline. Fifth grade students including Matthew Currey Jr. (left) stand proudly in front of their Refuse to Abuse Animal exhibit. On Friday, Gov. Dannel Malloy signed the Opioid Bill into law. This landmark legislation represents a significant step forward in our fight against heroin and opioid addiction. The bill caps prescriptions for adults to a seven day supply, eliminates insurance discrimination for overdose reversal drugs, and ensures first responders carry naloxone, a life-saving overdose reversal drug. On Saturday, June 25th Aspen Dental practices in Connecticut will be providing free dental care to veterans for their National Day of Service. Like millions of other Americans, veterans can struggle to find oral health care when they need it. Call 1-844-AspenHMM to schedule an appointment! Connecticut's uninsured rate fell to 4.9 percent in 2015, according& to new data released Tuesday by the Centers for Disease Control and Prevention. Approximately 36 percent of Connecticut residents received health insurance through a public plan in 2015, while 66.9 percent had coverage through a private health plan. This report is further proof that Connecticut has made incredible progress toward guaranteeing that every resident has access to health insurance. Recently, Connecticut took a pair of legislative steps toward drawing more hands into manufacturing. One measure would extend a $7,500 tax credit to small-business who hire eligible apprentices in manufacturing and other trades. Shorthanded-producers have also now opened their arms to female apprentices. Ms. Lenoce has become a great role model for female millennials looking to enter manufacturing. In April, she was one of the 130 females from across the U.S. who were honored in Washington D.C. by The Manufacturing Institute. To read more about manufacturing diversity, click here. United Technologies has created a battery that could be key in the search for a long-term sustainable energy source. Mike Perry, an electrochemical engineer who moved over from the fuel cell division in 2008, created this idea that is being deemed as the "holy grail for electric grids." With a series of large-scale batteries, utilities and large users can take some of their alternative power such as solar and wind and hold onto it until it's needed. East Hartford Mayor Marcia Leclerc is using $6,000 raised from the Mayor's Charity Ball to help the Old State House in Hartford develop an office for the kid governor and create a Civics Action Lab. The new “office” is a creative way to showcase the kid governor program and teach youth about civic engagement. I think that is a platform we can all get behind! Kid Governor Elena, an East Hartford 5th grader, said she'd want visitors to her office to learn about how to bring kindness back to their communities. I think that's a platform we can all get behind! State Board of Education Meeting, LOB 1D, 9:30 a.m. Safe Haven’s Working Group Meeting, LOB 1C, 2:30 p.m.